There are over 750 species of gall wasps (Family Cynipidae) in North America. They are all tiny and look pretty much alike. 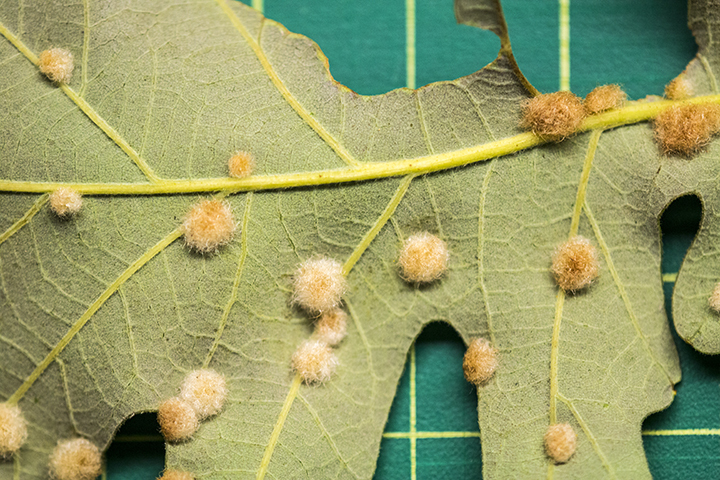 Fortunately, most can be identified by the appearance, location, and host species of the abnormal growths (galls) their larvae produce. Oak flake gall wasp (Neuroterus floccosus) galls are found on the underside of leaves of bur oak and swamp white oak. They occur singly though there are usually several galls on any one leaf. They are hemispherical, thickly hairy, and ⅛″ to 3 ⁄16″ in diameter including the hairs. The hairs are white at first but soon turn brown. Each gall contains a single chamber and a single wasp larva. It is revealed on the upper leaf surface as a smooth blister-like bump. This entry was posted in Insects and tagged Neuroterus floccosus, oak flake gall wasp on November 28, 2015 by John Valo. There are more than 2,000 living species of sweat bee (Family Halictidae) worldwide. They are so named because they are attracted to the sweat of humans. Fortunately, they seldom sting and when they do the sting is minor. There are four species of Augochlora in the United States, only one of which is found in Minnesota. Pure green augochlora (Augochlora pura) is a moderately-sized, solitary, metallic green sweat bee. It is very common in the eastern half of North America west to Minnesota. It is found from April to October in woodlands and nearby thickets and pastures. The overwintered mated female emerges in April. Using an existing insect burrow in dead wood as a starting point, she digs a nest consisting of many branched burrows. She places a pollen ball and nectar in each burrow then lays a single egg on the pollen ball. The first generation offspring emerge as adults in June. By the end of June they have constructed their own nests. The larvae or pupa of the last generation overwinter and emerge as adults the following spring. Adult females overwinter beneath rotting logs in a state of diapause. Males die in the fall. 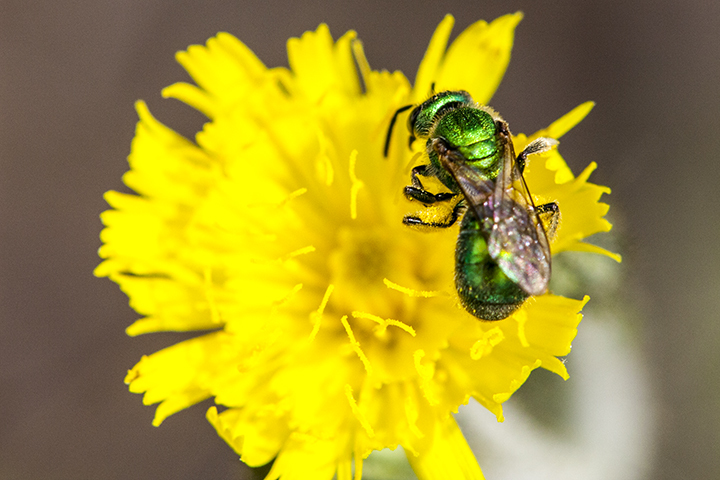 Sweat bees are identified by a short tongue with a short, pointed last segment; single groove below the base of each antenna; lobe at the base of the hindwing longer than the submarginal cell; and basal vein on the wing strongly arched. Pure green augochlora is distinguished by the completely bright metallic green or coppery body; abdomen not conspicuously striped; dark brown, oval-shaped structure at the base of each wing; wing with three submarginal cells, the first longer than the third; marginal cell of the wing squared off at the end; and upper margin of the plate on the upper lip intruded upon by lobes of the plate above it. This entry was posted in Insects and tagged Augochlora pura, pure green augochlora on November 25, 2015 by John Valo. 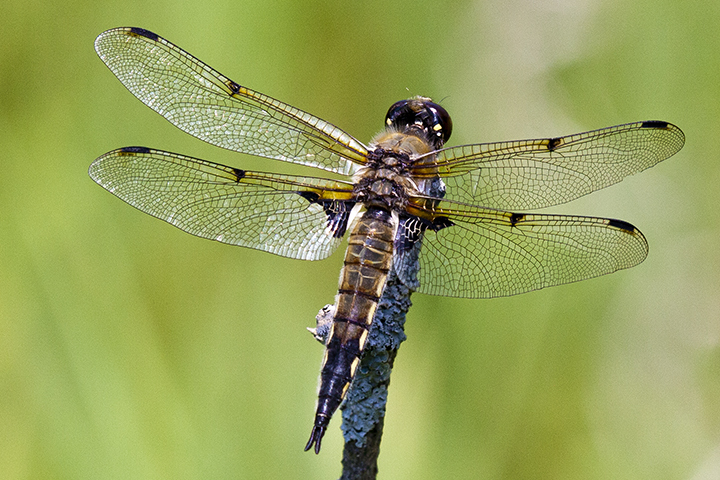 This entry was posted in Insects and tagged four-spotted skimmer, Libellula quadrimaculata on November 23, 2015 by John Valo. Ney Nature Center is a 446-acre park in Le Sueur County east of Henderson. It is adjacent on the north to Ney Wildlife Management Area and on the south to Henderson Station County Park/River Access. It includes the Minnesota River bluff to the west, the steep ravine of an unnamed, intermittent stream to the south, and prairie to the north. 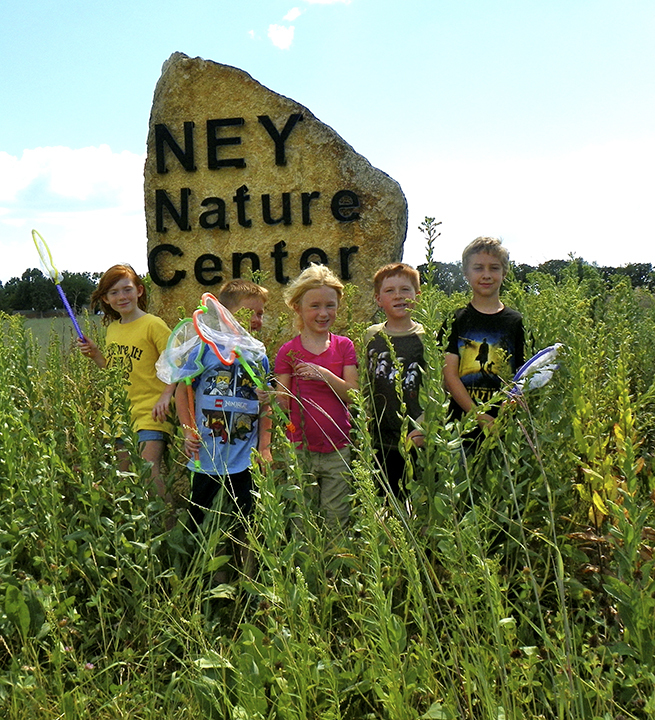 Ney Nature Center is a hybrid, both a Le Sueur County park, open daily to the public, and a nature center, providing educational events for groups of children. It is one of 70 Minnesota Christmas Bird Count locations. 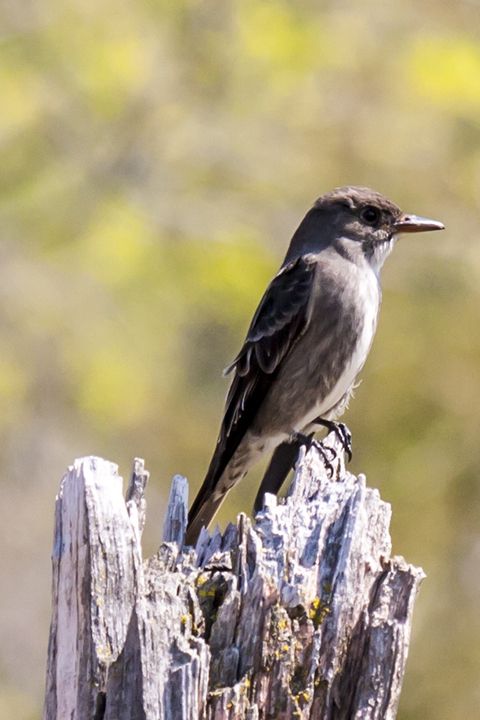 Seventy-two bird species have been sited on bird count days from 1997 to 2014. This entry was posted in Nature Destinations and tagged Ney Nature Center on November 21, 2015 by John Valo. Gray birch (Betula populifolia) is native to eastern United States and Canada as far west as Illinois. It has been recorded in Minnesota only twice, once in Anoka County in 2013 and again in Itasca County in 2015. In its native range it is an early successional tree colonizing burned areas, abandoned pastures, road cuts, and other disturbed areas. Gray birch is one of the smallest trees in the northeast, usually no more than 30′ tall and about 6″ in diameter at breast height. It is short-lived, seldom surviving more than 50 years. The resemblance of the leaves to those of quaking aspen (Populus deltoides) is the source of the species name populifolia. 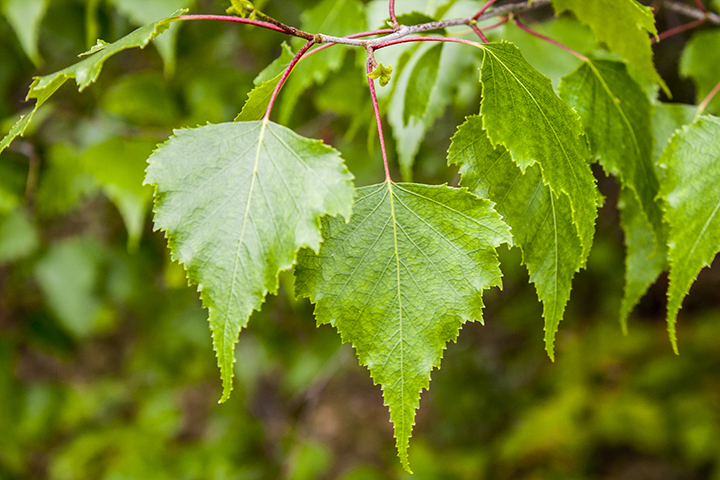 Gray birch is easily identified by the aspen-like triangular leaves with flat bases and long, drawn-out tips. It is also distinguished by grayish-white bark that does not easily peel; dark triangular patches at the base of each branch and branch scar; and male catkins that occur individually, not in groups. This entry was posted in Plants and tagged Betula populifolia, Gray birch on November 20, 2015 by John Valo. 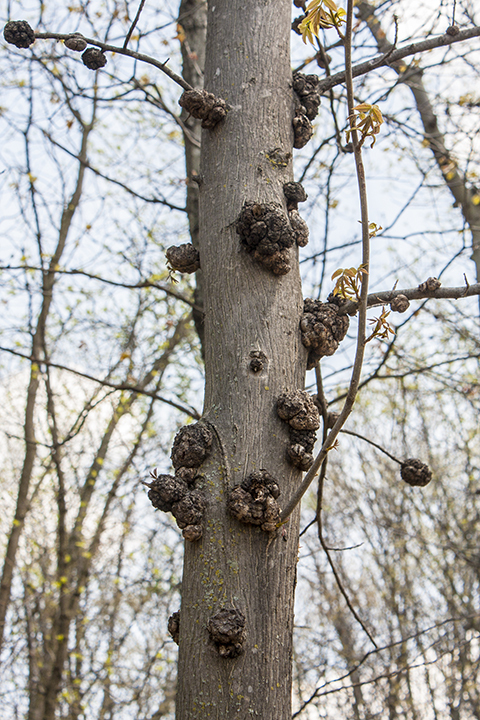 Galls may occur singly or in clusters on the trunk and branches. They are woody, rough, more or less round swellings. They appear as tight clusters of nodules. 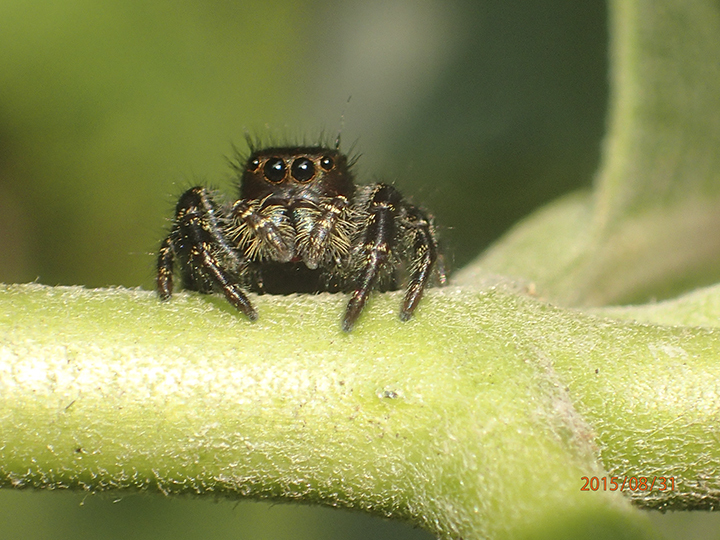 They can be very small to 10″ in diameter. If cut open they reveal disorganized woody tissue but no insect chambers or tunnels. This entry was posted in Fungi and tagged Phomopsis gall on hickory, Phomopsis spp. on November 18, 2015 by John Valo. Peeling Puffball (Lycoperdon marginatum) is a common and widespread, medium-sized puffball. It appears on the ground, individually, scattered, or in groups, usually in sandy soil. It is often found in the woods under deciduous or coniferous trees, but is also found in the open on roadsides and in waste places. The skin is covered with short, erect spines that often aggregate in groups of 2 to 4 creating pyramid-shaped warts. As it ages, the outer, warty or spiny skin sloughs off in thick, irregular patches or chunks revealing the smooth, pale to dark brown inner skin below. When mature, a pore-like mouth develops at the top through which spores are released. Peeling Puffball is distinguished by the outer skin that is covered with pyramidal warts and sloughs off in thick, irregular patches or chunks. 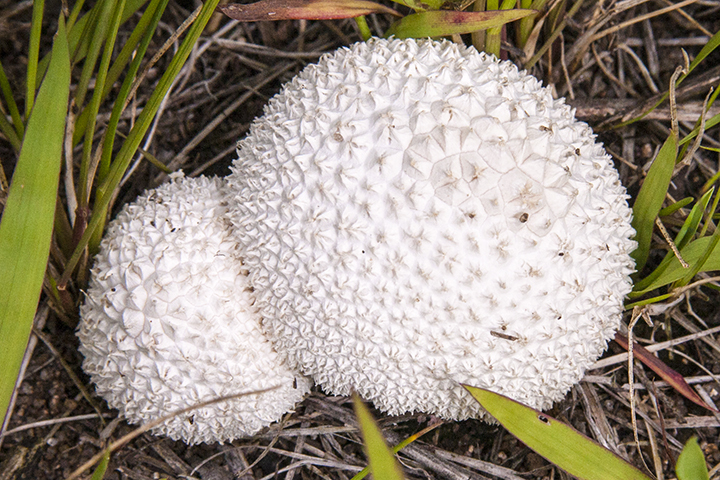 This entry was posted in Fungi and tagged Lycoperdon marginatum, Peeling Puffball on November 15, 2015 by John Valo. 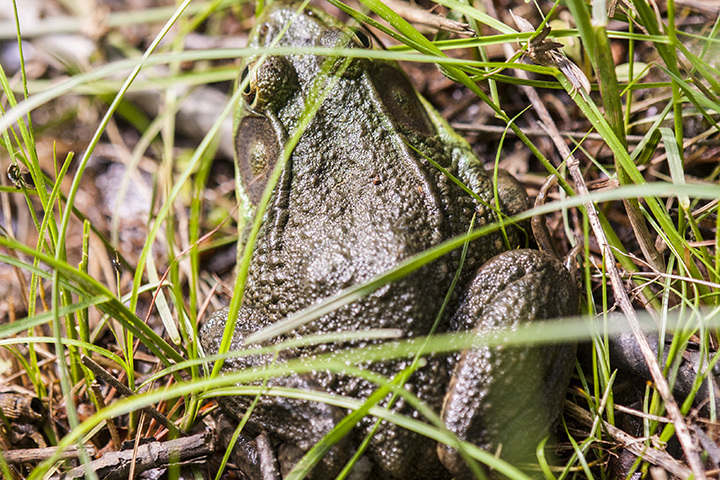 This entry was posted in Amphibians and tagged green frog, Rana clamitans on November 13, 2015 by John Valo.